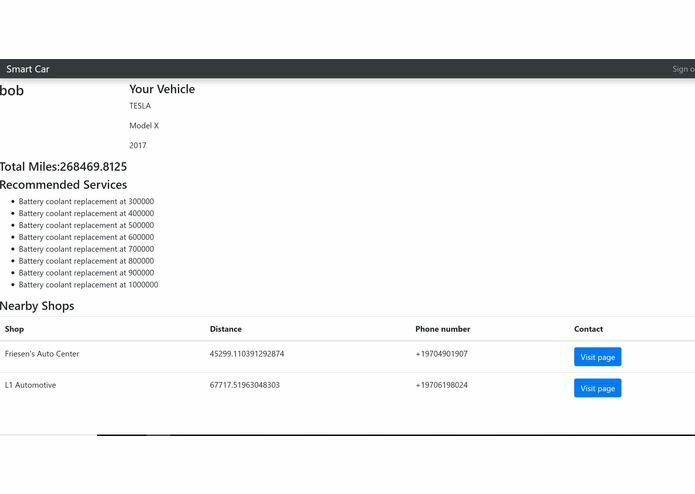 We put ourselves in user's shoes and believed that users would benefit most by locating nearby services to maintain their cars. We connect smart cars to nearby service shops based on cars mileage and location. With the available information presented at SmartCar, we allow users to maintain their cars with services such as oil change, tires changes, and brake fluids. We connected with Yelp API and populated the necessary information for the users. Users are able to determine hours, closest locations and services required for the car. Collaboration. Our team is super supportive and inclusive of other members regardless of skillset and background.